For a guy who doesn’t play a lot of military-themed shooters, I’ve been hitting the Call of Duty series pretty hard this week. It’s a good way to grind through the backlog, and it’s interesting seeing how the game series has evolved over time. 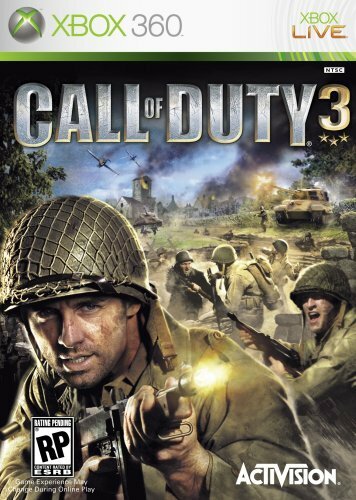 Going back to Call of Duty 3 after playing so many of the modern entries is a big step back in some ways, especially production values. It’s not a great looking game – let’s be charitable and say that the visuals are, um, “functional”, and I somehow doubt that there’s going to be licensed music playing over the ending credits. It’s also a much slower-paced game. I don’t think there IS a run button – if there is, I haven’t found it yet – and the act of aiming feels like trying to push an oar through molasses. Fortunately, the enemies are also prone to standing still and there’s a lot of aim assist. It also doesn’t seem to feature respawning enemies, which is a HUGE change of pace. You can take your time with each encounter, without feeling compelled to always rush forward to cross the next invisible line to turn off respawns. It’s possible that I’m just not seeing the respawns – I am playing on easy, for the sake of expediency, after all – but I honestly think they’re just not there. This game got a lot of bad press back in the day, and I had pretty low expectations going in. So far, I have been pleasantly surprised at pretty much every turn. Still, I’ve only finished 5 out of 14 levels. Plenty of time left for disappointment.